John’s graduate project involved turtle nesting habits. Between the glacial sand and the many pothole lakes on the Kingston Plains, this area was a turtle nesting paradise. Our final project documentation would not be similar, but our data gathering methods were. The biggest difference was our schedule. I did all my data collection in the daytime while John spent many a night out on the plains looking for tracks that would lead him to turtle nests that he would mark. He would then revisit the sites the next day to dig up and count the turtle eggs in the nest. Late one evening, John asked if I wanted to come along and check out the plains after dark so we piled into my truck and off we went with flashlights in hand to track the elusive turtle tracks that would lead us to their nests. The plains at night were eerie because the treeline was so far way in every direction, it made the sky look even bigger than normal. We happened to be there on a moonless night so the stars were brilliant. Walking without a flashlight would have been extremely hazardous with all of the stumps and roots. We turned off our lights a few times and it could not have been darker had we been standing on a pile of coal. It didn’t take long for John to find his first set of turtle tracks going down a sandy two rut road so we followed them until we found what looked to be a newly covered nest. John Marked it with a little powdered chalk and a small flag on a wire stick. Once he returned to count and measure the eggs, he would blot out any traces of these markings so no one else would be tempted to mess with the nest. We repeated this routine at a couple of different locations and were getting ready to pack it in when John tapped me on the shoulder and made a strange, guttural sound that I couldn’t quite make out. When I turned to inquire what he had said, he was staring off to the east with his mouth wide open and nothing resembling words coming out. Then I knew why. Coming toward us at a high rate of speed was an extremely bright light with two smaller bright lights on either side. There was absolutely no sound besides the croaking frogs. The two smaller lights were bouncing up and down in unison. For the second time that summer, I suddenly envisioned myself being carried away only this time it wasn’t going to be by a giant bird but a different kind of ride on a craft of unknown origin. We were too far from the truck to make a run for it (not that we would have been able to as we both seem to have developed feet of stone) so all we could do was stand there and watch this UFO hurtle toward us. When the lights were almost directly on top of us we heard the deafening roar of the bomber’s eight engines. I started to giggle and out of the corner of my eye, I could see John giving me a sideways glance as if to say, “What in God’s green Earth is so funny?” “It’s a B-52 from Sawyer!” I finally managed to blurt out. “Is it crashing?” he asked. As we watched it recede to the west, we headed back to the truck and I explained what I knew to John. In that moment of surprise, I had totally forgotten that I had been watching B-52 bombers making low level runs like this for a couple of weeks. At times they were so low, I could see the rivets in the belly of these massive planes as they passed. “What is with the bright lights?” John inquired. My best guess was they were using their landing lights to give some point of reference between them and the dark ground they were flying so close to. I had to ask: “Tell me John – for a split second there, did you think we were on our way to another planet aboard some alien craft?” John thought for a minute and replied, “Well, I guess no more than you thought you were going to be picked up by a gigantic sandhill crane. Why didn’t you mention the low flying jets before we got out here?” I had to admit that I had only been on the plains during the day and wouldn’t have even thought about them doing the same thing at night. I used to enjoy the sight of low flying craft when Sawyer was still in operation. In the summers I worked at the Huron Mountain Club, we often saw fighters and bombers practicing low level runs between the peaks of the Huron Mountains. On one such occasion, we could clearly see the B-52 crew jauntily waving at us as we stood atop Mount Ives. Interestingly enough, they were actually lower than we were (Mount Ives elevation is a little over 1260 feet above sea level, or a little more than 600 feet above the level of Lake Superior). When they saw us wave back, they gave us the traditional ‘wing waggle’ acknowledgement in return. I had learned early on how effective waving at passing aircraft could be when we still lived on the corner of Norway and Center in Marquette (before the NMU campus had spread that far west). A bunch of us were playing baseball in the field across from my house when we saw a two rotor helicopter from Sawyer flying by (a rather unique design were the two rotors were set at a slight angle to each other and reminded me a lot of an upside down egg beater). (ed note: for the true aviation buffs out there, here is a more technical description: Twin non-coaxial rotor configurations, intermeshing rotors – A subgroup of twin non-coaxial rotors is the twin intermeshing rotor system, seen only on a few helicopters made by the Kaman company, including the H-43 Husky and K-MAX. The rotors are mounted very close together and actually intermesh, i.e. the blades on one rotor travel through the rotor disk of the other rotor. Of course, the intermeshing of the rotors is carefully timed to keep the rotors from chopping each other to pieces. There aren’t many flyable H-43s left, but when they are airborne, they are indeed an interesting sight.) Yes, it was one of these and they were indeed an interesting sight! We stopped the game and were jumping up and down waving as they passed by and to our astonishment, they circled around and landed in the middle of our makeshift ball field. They stayed long enough that all of the neighbors up and down the block came out to inspect the craft. Eventually, the pilot said, “Well, we better get back in the air before they wonder where we went” and off they flew. F-101 and F-111 fighters often flew low level passes across the base of the Abbey Peninsula that separates Keweenaw Bay and Huron Bay. Our camp is located at the head of Huron Bay where the mouth of the Silver River widens out into the bay. As they crossed the peninsula from west to east, the jets would fly directly over our camp so low it would rattle the windows, not to mention our nerves. As soon as they were over the end of the bay, they would perform a steep climbing turn to the left, circle out over the bay, and then perform another steep banking turn to the right to line themselves up for a return run reversing the route they had taken a few minutes before. When the humidity was right, we could see little corkscrews of water vapor condensing behind the wing tips as the jets began their climbing turn over Huron Bay. This happened enough that we thought nothing of the roar that enveloped the camp when they performed this maneuver after dark. One late fall evening we heard the familiar sound of a passing jet and someone commented, “That one didn’t sound right.” Imagine our surprise when the WLUC-TV6 late news reported the crash of a fighter somewhere northeast of L’Anse. The pilot ejected after experiencing engine trouble and was later found near the top of the peninsula between our location and the old farming community of Aura. It has been a long time since I last had an encounter with a large, low flying object. 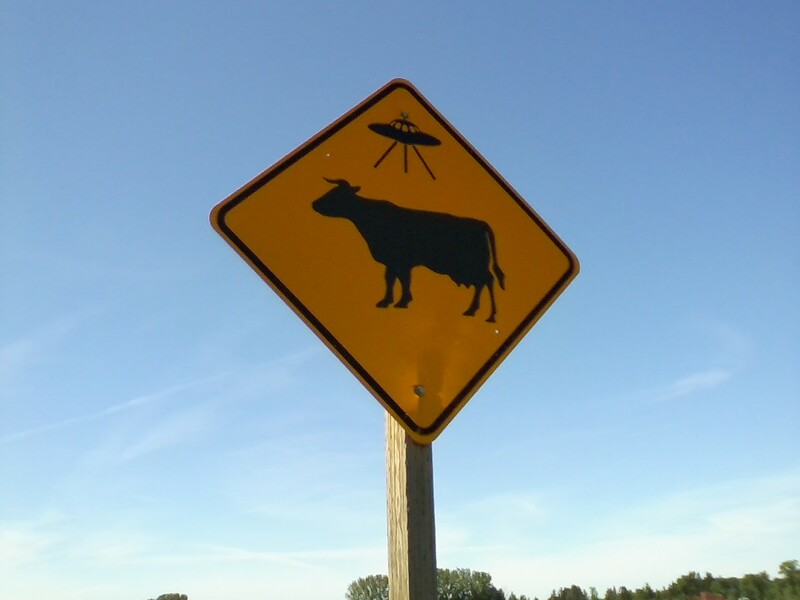 It is something I think about every time I see the ‘UFO-COW’ sign on the road between Greenland and Ontonagon. I bet the cow isn’t thinking about being carried away! The top piece video had to be 8 Miles High, of course – which Roger McGuinn introduces as ‘not a drug song’ in this performance with Gene Clark at the Capitol Theater in 1978.